Woe, the story be done, and I am sadder for it. A tad too dramatic? That may well be, but that’s the thing will brilliant storytelling, you don’t want it to be over. And that’s exactly how I felt as I was nearing the end of the fourth book in James A Moore’s Seven Forges series (Angry Robot Books). It’s a terrible thing watching your bookmark move ever closer to the end. Part of you craves the conclusion while that other part of you is yelling to slow down, to prolong the read for as long as you can. But I finally closed the cover on The Silent Army, and I can say without a shadow of doubt this is one of the best fantasy series I’ve read. Now before I embark on the small breaking-down of the book, let’s get the spoiler alert over and done with. While that’s happening, don’t mind me while I clean the cobwebs out of this blog – s’been a while, folks. HERE THERE BE SPOILERS! THERE, THERE BE SPOILERS! EVERYWHERE, SPOILER SPOILERS! Now I’m going to give you one final chance to bail now, because if you haven’t read book three (City of Wonders) then the beginning of the next paragraph is going to rob you of an epic reveal so turn away now. Go on. No sneaky-peeks. The story is told from both sides – from characters fighting for the empire of Fellhein, and from the Sa’ba Taalor. Multiple viewpoints only increased the connection I felt with all of the characters. Sure, there are some that don’t resonate as well as others, there are some that are… well, asshats, but diving deep into the beliefs and motivations for both sides makes it difficult to pick a side – there’s an honesty in that. There are also those now caught in the middle: Drask Silver Hand (he’s a fave), Nolan March, and Tega – their venture in the Mounds has them almost lifted to the power of gods, and causes much introspection about their involvement in the war. Then there’s Andover (Lashk) Iron Hands – once Fellhein, now very much Sa’ba Taalor. These four play pivotal roles in the outcome of the war, although Moore gives you only just enough to wonder what’s at play before slapping you upside the head with the revelations – and there are many. I can’t go further without again sending a big kudos to Moore for his magic system – especially that of the Sa’ba Taalor. It’s brutal, it’s beautiful, and it brokers no dissent. The gods of the Seven Forges are moving house, and they’re usurping mountains, creating their own if need be, and they’re doing it on a grand scale – their kings will die, and die well, to ensure it. The Sa’ba Taalor are born for battle, while the Fellhein army has somewhat fallen on its laurels. Moore shows the reader the difference between warrior and soldier. But the Fellhein have the Silent Army – large stone soldiers that protect Old Canhoon. Stone soldiers that move via the walls, stepping out and attacking those Sa’ba Taalor who have hidden in the meat-sacks of Fellhein individuals as they wreak havoc on the city before it settles back to earth (ah, King Swech, you kick serious bum, girl!). It’s an army that’s the match of the Sa’ba Taalor, and their battles are ferociously good. There’s so much good about this book, about this whole series that I can’t even begin to explain why you should be reading this. I was completely and utterly immersed in this world, and I damn well didn’t want to leave it (or be forced out by the end of The Silent Army). The only recompense is that there are three more in the series, the first of which is at least a year away. But don’t think you need to wait for those before starting on this series – books one through four have a complete story arc. And a special shout-out to cover artist Alejandro Colucci, whose covers for the whole series were just gorgeous. With a glut of books on the market, take my word that this is a series you’re going to love. You’ll be invested, you’ll be immersed, and you’ll wonder why you didn’t pick these books up earlier. It’s epic fantasy at its best. The writing is strong, the characters beautifully flawed, and the magic systems are wonderfully unique. 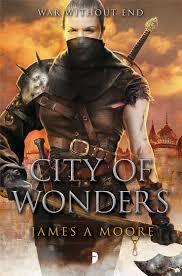 James A Moore is one of those writers that as a reader, you love; and as a writer, he makes you want to be better. Yes, yes, I’m a bit late with the next instalment of Festivus Book Pimping, but I’m going to try and get as many authors/books pimped before I head away next week for my Christmas break. 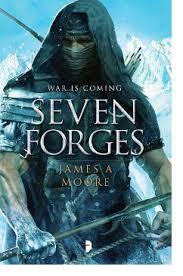 So, next up on the Festivus altar is another overseas author, all round nice guy, and hell of a writer, James A Moore. Round of applause! Now Jim has quite a backlist of novels and short stories, all of which you should read. But today I’m going to focus on the fantasy series I’m currently reading: The Blasted Lands, published through Angry Robot. I’d been meaning to get these books for a while, but my laziness worked in my favour, with the latest book (third in the series), just released. The series begins with Seven Forges, and the introduction to two races of people – those from the Empire of Fellein, and the fantastical, half-forgotten, and oh-so mysterious Sa’ba Taalor. And it’s those of the Blasted Lands that really held my attention – Drask Silver Hand, Swech, Tusk and their gods (and their magic), are vastly different from anything I’d read, and I was so very taken with them. Hell, I couldn’t get enough. Told from the viewpoints of the major characters of Captain Merros Dulver, the Emperor, Desh – the emperor’s sorcerer, and those of the Sabar Taalor, you get to experience the lives and fears, the cultures and impending war of the two races. Moore handles it masterfully, and I couldn’t wait to get into the second book. 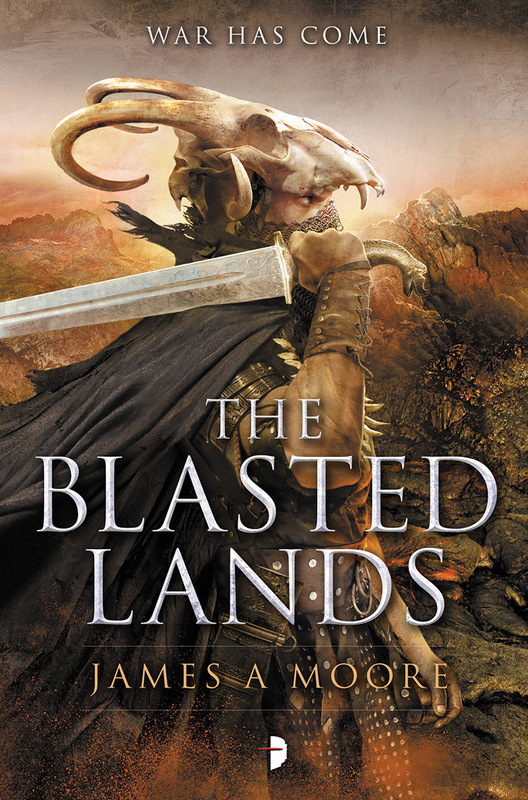 The Blasted Lands follows up with action, betrayal, amazing magic, gods and rituals, and a final understanding of why the Sa’ba Taalor hide their faces from those outside the Blasted Lands (and damn impressive this is). War is coming. Not if, but when, and the people of Fellein… well, it ain’t looking good. As a second book, they can sometime fall flat, but Moore just amps it up, and I flew through this reading as well. City of Wonders is next, and while I’d love to tell you more about this one, I’m only three chapters in, but I’m hooked and wondering how I can steal time so I can read more. There’s a fourth in the series that Moore is currently writing, and I’ll be first in line to buy that baby. Oh, and a shout-out to the cover-artist of these books – they capture the characters perfectly, and are just gorgeous. Now I can’t have you leave without telling you about one of my favourite of Moore’s characters, Jonathan Crowley. There is many a story with the dark Mr Crowley, and I’ve had the pleasure of being the editor of a couple of Crowley stories in the SNAFU series put out through Cohesion Press. Crowley is a monster hunter, and quite possibly a monster in his own right, but damn if he ain’t fun to read. Moore’s Crowley stories are more supernatural horror, and one of my favourites is the short story, Cherry Hill. Addictive, this character is, and I’m always happy with a new Crowley story. 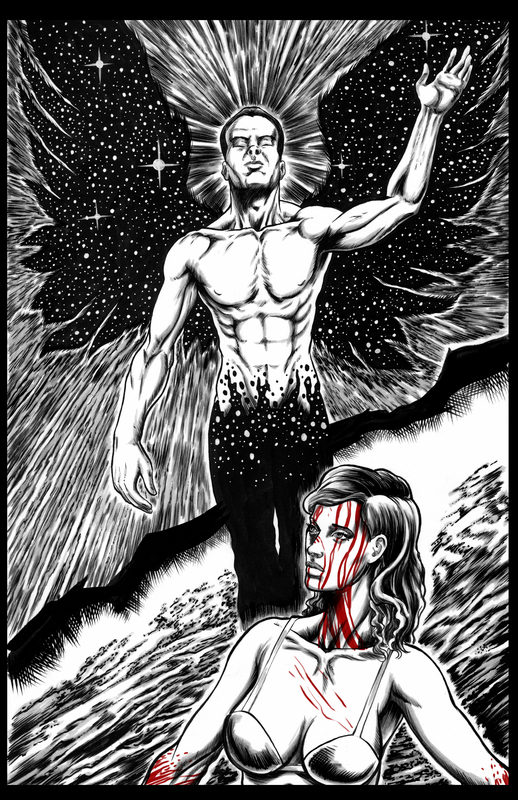 Oh, and I’ve just finished editing a new Crowley story for SNAFU: Hunters, and it’s a cracker! For the Blasted Lands series, anyone who loves epic fantasy, dark fantasy, magic and monsters and mayhem, oh my! For the Crowley books, anyone who loves supernatural horror, horror, dark fiction, and monsters straight from your nightmares! 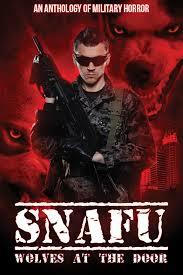 SNAFU: An anthology of Military Horror is out in the world! This massive tome, put out by independent Australian publisher, Cohesion Press, is the first in an annual military-themed antho. When owner and editor in chief, Geoff Brown, got in touch and asked if I’d like to be involved, I responded with a hearty HELL YES. It’s been a good couple of years since I’d worked on an anthology (the last being Midnight Echo Issue 8) and I’d forgotten how much I enjoyed working with a slew of authors to weave a theme through their stories. And what a kick-arse bunch of stories they are. While I was only involved on the editing side of SNAFU, with over a thousand submissions, Geoff Brown has done a remarkable job in his choices for the anthology, and the stories within are a testament to the writers themselves. There are some cracker tales in this book, covering all manner of conflicts, time periods, and monsters. Ooh, we can’t forget the monsters! There’s a plethora of ghosties and ghoulies, born right out of your nightmares. With a veritable who’s who of the genre, there are stories from best-selling authors Greig Beck and Wes Ochse, plus a gritty Joe Ledger story from the master Jonathan Mayberry, and if you’re a fan of James A Moore (that’d be me), there’s a new Jonathan Crowley novella inside. But it’s not just about the big names, the stories from all the authors in this anthology are fantastic and I had a great time working with them and their tales – it was real pleasure, and if this is the mark of authors moving through the ranks, then the publishing and reading worlds are the real winners here. 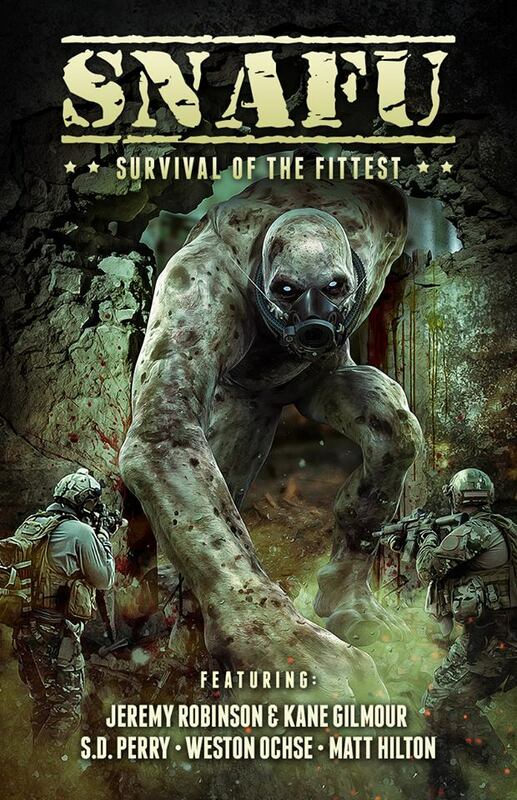 And for those of you wanting to write some military-based horror? Keep your eyes on Cohesion Press for the next call for submissions.